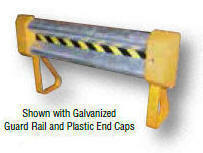 Protect personnel and equipment both visually and physically with our Guard Rail Systems. These economical systems can be utilized indoors or outdoors. 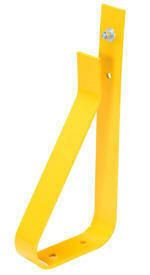 Ideal for protecting corners of buildings and machinery from fork truck and vehicle damage. 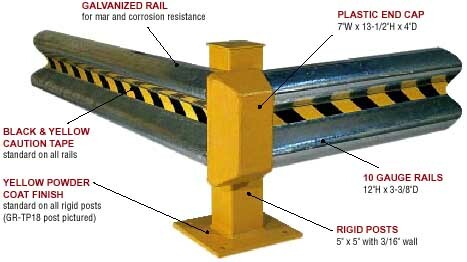 Choose between one, two, or three high rail systems. 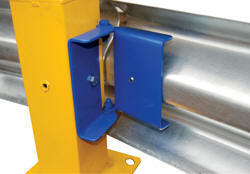 Tubular posts are machined for continuous or perpendicular rail mounting. GR series has rail slotted mounting holes ¾” x 2-1/2” provided, mounting hardware not included Floor mounting kit sold separately. Deduct 5" when overlapping on a shared post. Units are rated for 4,000 lbs. at 4 mph. 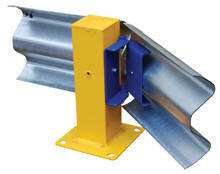 Model PDF Mounting Posts Required Height Length Radius Wt.